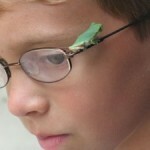 We are excited to announce the winners of the second annual 2011 FROGS ARE GREEN photo contest. We were thrilled to receive such fabulous entries, and it was difficult to pick winners. We hope you will continue your adventures as amphibian photographers and enter next year’s photo contest! 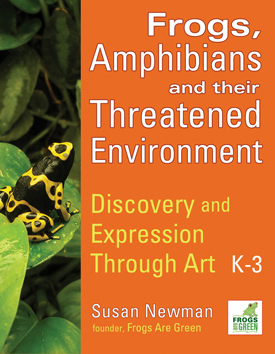 We accepted photos in two categories: Frogs in the Wild and Backyard Frogs. Photograph by Sara Viernum, Barking Treefrog holding onto to a reed in a vernal pond in the Talladega National Forest in Northeastern, Alabama. Tree frog in Lily, photographed by Brian Blom, Deerwood, MN. 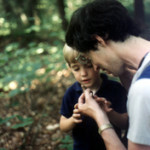 Photograph by Krista Herbstrith who says, "I was showing my son the frog on the flowers from the garden, when the frog leaped and landed on my son's face," Northfield, MN. Photograph by Sara Viernum - Barking Treefrog is hunting for insects under the front porch light on a house in Oxford, Alabama. This photo by Jan Knizek wasn’t easily categorized, but we wanted to give it special mention because it poignantly tells the story of how European Green Toads and other amphibians are losing their habitats through over development. This is one of a very few breeding sites of the toads in Prague, Czech Republic, and is currently endangered by a development project. Photograph taken by Jan Knizek taken at one of a very few breeding sites in Prague, Czech Republic, currently endangered by a development project. 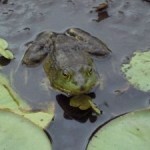 Frogs Are Green 2012 Photo Contest: Now Open for Submissions! 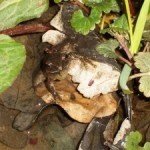 FROGS ARE GREEN 2010 Photo Contest! This entry was posted in Contests, Frogs Are Green contests, Frogs Are Green Photo Contests, Photographing Frogs and Toads and tagged Frogs Are Green contest, Frogs Are Green photo contest, photo contest amphibians, photo contest environmental themes, photo contest green themes, photo contest nature, photo contests animals, photographing amphibians, photographing backyard frogs, photographing frogs, photographing frogs in the wild, winners of Frogs Are Green 2011 photo contest. Bookmark the permalink.